Establishing a self managed (“do it yourself”) superannuation fund is becoming increasingly commonplace in Australia and is the alternative option to using an independently managed super fund (such as available through employer, retail or industry based superannuation providers). Self managed super funds perform the same function as other super funds, namely to provide retirement and other ancillary benefits for their members. The key difference, however, is that members of self managed funds must also act as trustees and are therefore ultimately responsible for all investment decisions and the ongoing management of their fund. Why establish a self managed super fund? 1) Control – trustees have complete control over the fund and its investments (within the legislative framework). This is attractive to those who wish to be more involved in the management of their monies. 2) Flexibility in investment decisions – trustees are able to invest in any approved assets, which may include investments such as shares, property (including direct residential or commercial) or managed funds. More advanced strategies such as investing in business real property, using gearing or borrowing (in certain circumstances) or active direct share investing, are possible, which can provide additional scope to maximize ones retirement assets. These avenues are generally unavailable through traditional superannuation channels. 3) Estate planning – Future generations may be more effectively cared for, through the greater flexibility provided via a SMSF. In addition, SMSF’s can be tailored to meet your specific estate planning needs, compared to other alternatives which have to meet the needs of many investors. 4) Cost Effectiveness – For larger amounts, SMSF’s may be particularly cost effective, as many costs are fixed and therefore fall as a percentage, as the amount of invested funds increases. 5) Tax Advantages – Whilst self managed super funds operate under same taxation rules as any other super fund, they may allow a more transparent and effective approach to minimizing tax payable. For example, funds may be managed to specifically provide tax advantages beyond those generally available to members. These may include investing to maximizing imputation credits via Australian equities or depreciation via direct property, which can reduce tax payable (including contributions tax). 6) Holistic Approach – SMSF’s have the ability to provide for one or more members (often family members) wealth accumulation and pension needs. This means they may be used in a holistic manner throughout a members lifetime. Lodging an annual SMSF return with the ATO and appointing an approved auditor to audit your fund. meeting the sole purpose test (a fund must be for the purpose of providing retirement benefits to members). Significant penalties may apply for trustees not meeting their obligations. Who is a SMSF suitable for? While SMSFs are great for some people, they don’t suit everyone. Managing your own super takes time, knowledge, skill and money, so before deciding to set up a SMSF, it’s important to consider these issues. Should you wish to take advantage of a SMSF to assist in your retirement planning, but don’t have the ability or willingness to perform the various administration or investment functions, utilising an advisory service can assist in this regard. If you don’t already have your own DIY super fund but are interested in setting one up, an adviser at PGFS can assist in this process, its administration over time and the management of the funds assets. Alternatively, if you have a SMSF and wish to consider your options to improve its performance or management, please call us or e-mail info@pgfs.com.au. Pension or annuity? What’s the difference? Annuities can be purchased from life insurance companies using superannuation money or, in some cases, other savings. An account based pension or annuity (also called an allocated pension) is one of a number of products that you can buy with a lump sum from a superannuation fund, or paid from a self-managed superannuation fund, to give you an income during your retirement. Account based pensions can be purchased from superannuation funds using superannuation money (that is money paid out from a superannuation fund or retirement savings account (RSAs). Account based annuities can be purchased from a life insurance company using superannuation money. An investment account is set up with this money from which you draw a regular income. A minimum payment must be made at least annually. There is no maximum limit set on the income that can be drawn each year giving you greater flexibility in determining your income requirements. The capital value of the pension or annuity, and the income from it, cannot be used for borrowing. You may choose how your money is invested by the fund manager (known as ‘investment choice’). Fund managers have different investment strategies, which you can select, that carry different levels of risk and, therefore, potentially different levels of return. Account based pensions and annuities give you the flexibility of having access to your money at any time. You can withdraw some or all of the money above the minimum amount as a lump sum (this is known as full or partial commutation). For age 60 and over: All pension payments from a taxed source (where the super has been taxed in the fund) are tax free when paid to individuals aged 60 or over. For under 60: Pension payments for individuals aged under 60 are taxed. Your eligibility for the age pension is worked out by taking into account both how much income you get (the income test) and how much your assets are worth (the assets test). The test that results in the lower rate of age pension is the one that is applied. For the purposes of the income test for the age pension, income from an account based (also known as an allocated pension) or annuity will be reduced by an amount that represents the return of your capital. This has not changed. An account based income stream is assessed under the assets test for the age pension. The pension assets test taper is $1.50 per fortnight for every $1,000 above the relevant threshold. A lifetime pension or annuity is one of a number of products that you can buy with a lump sum from a superannuation fund or other money to give you an income during your retirement. If you already have a lifetime pension or annuity you will not be able to transfer to a new account-based pension or annuity. Lifetime pensions can be purchased from a superannuation fund using superannuation money (that is money paid out from a superannuation fund or a retirement savings account (RSA). Lifetime annuities can be purchased from a life insurance company using either superannuation money or other savings. Joint lifetime annuities, where income payments are made to two or more beneficiaries, can only be purchased with other savings (that is non-superannuation money). Lifetime pensions or annuities provide income payments for your lifetime and for the lifetime of reversionary beneficiaries (if any). Investment choice (which is where you choose how your money is invested by the fund manager) is not relevant because the income is fixed subject to indexation. Income is fixed at commencement and can be indexed to increase each year, either by a fixed percentage or in line with inflation. Generally, the money in the income stream cannot be taken out (also known as non-commutable). The income stream can be set up on a reversionary basis so that income payments continue to be paid to a beneficiary, such as a spouse or dependant, when you die. Your beneficiary will not usually receive the same level of income payments that you received (that is the payments are usually reduced). The option of a guaranteed period is also available. If you die within the specified guaranteed period, your nominated beneficiary (or your estate) will be entitled to receive either the remaining income payments as an income stream or lump sum. Unlike the reversionary beneficiary option, the income payments received under a guaranteed period will not reduce. For age 60 and over: All pension payments from a taxed source (where the super is taxed in the fund) are tax free when paid to individuals aged 60 or over. For the purposes of the income test for the age pension, income from a lifetime pension or annuity will be reduced by an amount that represents the return of your capital. The income test will not change under the new rules from 1 July 2007. Lifetime income streams can be complying income streams if they have certain features in the Social Security Act 1991. Complying lifetime income streams bought on or after 20 September 2004 will be 50% exempt from the assets test for the age pension. Complying income streams bought before 20 September 2004 are 100% exempt from the assets test for the age pension. However, this exemption will be removed for income streams purchased on or after 20 September 2007, but will not affect the assets test treatment of income streams purchased before this date. A life expectancy pension or annuity is one of a number of products that you can buy with a lump sum from a superannuation fund or other money to give you an income during your retirement. If you already have a life expectancy pension or annuity you will not be able to transfer to a new account-based pension or annuity. Life expectancy pensions can be purchased from a superannuation fund using superannuation money (that is money paid out from a superannuation fund, or a retirement savings account (RSA). Life expectancy annuities can be purchased from a life insurance company using either superannuation money or other savings. 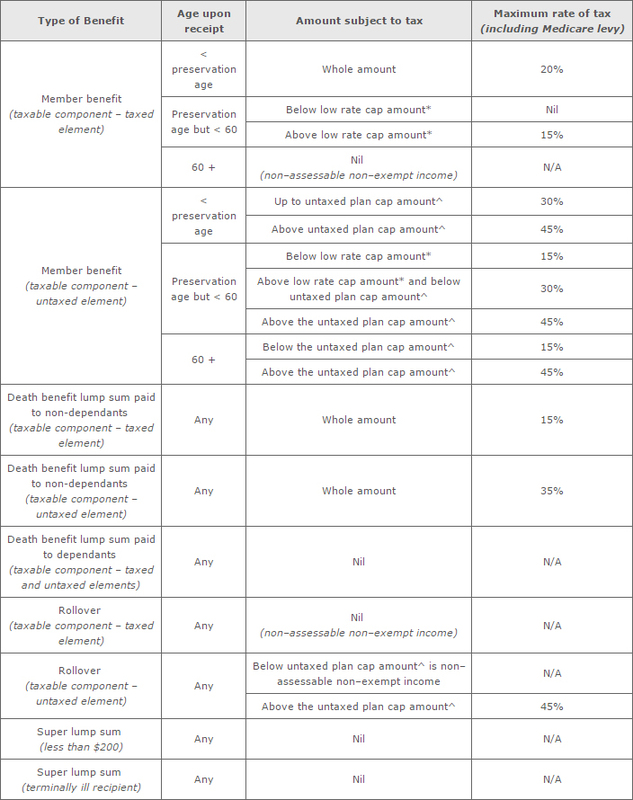 Joint life expectancy annuities, when income payments are made to two or more beneficiaries, can only be purchased with other savings (that is non-superannuation money). Life expectancy pensions and annuities provide income payments fixed for a term that is based on your life expectancy as if you were 5 years younger. Investment choice (which is when you choose how your money is invested by the fund manager) is not relevant because the income is fixed subject to indexation. You can choose to have part of your initial investment repaid to you at the end of the term. This is called the residual capital value. Income is payable for a term which lies between your life expectancy at purchase or your life expectancy as if you were 5 years younger. You can choose a reversionary beneficiary for the income stream. If the reversionary beneficiary is your partner (that is your spouse or de facto), and their life expectancy is longer than yours, then you can choose to have your income paid for a term between their life expectancy at purchase, or their life expectancy as if they were 5 years younger. If you purchased a life expectancy pension or annuity before 20 September 2004, then different rules apply. Under the old rules, income is payable for a term equal to your life expectancy at purchase, or for a term of 15 years if your life expectancy was more than 15 years. These rules no longer apply. For age 60 and over: All pension payments from a taxed source are tax free when paid to individuals aged 60 or over. For the purposes of the income test for the age pension, income from life expectancy pension or annuity will be reduced by an amount that represents the return of your capital. The income test will not change under the new rules from 1 July 2007. Life expectancy income streams can be complying income streams if they have certain features. A life expectancy income stream bought on or after 20 September 2004 will be 50% exempt from the assets test for the age pension. However, this exemption will be removed for income streams purchased on or after 20 September 2007 but will not affect the assets test treatment of income streams purchased before this date. A fixed term pension or annuity is one of a number of products that you can buy with a lump sum from a superannuation fund or money from other sources to give you an income during your retirement. If you already have a fixed term pension or annuity you will not be able to transfer to a new account-based pension or annuity. Fixed term pensions can be purchased from a superannuation fund using superannuation money (that is money paid out from a superannuation fund or a retirement savings account (RSA). Fixed term annuities can be purchased from a life insurance company using either superannuation money or other savings. Joint term annuities, where income payments are made to two or more beneficiaries can only be purchased with other savings (that is non-superannuation money). Fixed term pensions and annuities provide income payments for a fixed term (usually between 1 and 25 years). The income stream can be set up on a reversionary basis, so that income payments continue to be paid to a beneficiary, such as a spouse or dependant, when you die. For the purposes of the income test for the age pension, the amount of income assessed will depend on a number of factors including your life expectancy and the term of the product (in most cases, must be greater than 5 years to qualify). A fixed term income stream is not a complying income stream and as a result is fully assessed under the assets test for the age pension. If you make super contributions under an effective salary sacrifice arrangement, you may be able to increase your superannuation balance by reducing your assessable income for taxation purposes. Super contributions are not a fringe benefit. If salary sacrificed super contributions are made to a complying super fund, the sacrificed amount is not considered a fringe benefit for tax purposes. need to include the super contributions as a reportable fringe benefit amount on your payment summary. Salary sacrificed contributions are treated as employer contributions. If salary sacrificed super contributions are made to a non-complying super fund, the contributions will be a fringe benefit. need to record the sacrificed amount on your payment summary as a reportable fringe benefit. If you are under 75 years old, your employer can usually claim a tax deduction on the amount of salary sacrificed contributions they contribute to your super fund on your behalf. The sacrificed component of your total salary package is not your assessable income for taxation purposes. This means that it is not subject to pay as you go (PAYG) withholding tax. As you influence the amount of the extra super contributions your employer makes to your super fund, any salary sacrificed amounts will be reportable employer superannuation contributions. The reportable employer super contribution will be included on your payment summary and will affect the income tests for some tax offsets and deductions, the Medicare levy surcharge, and certain government benefits and obligations. If you make super contributions through a salary sacrifice agreement, these contributions are taxed in the super fund at a maximum rate of 15%. Generally, this amount of tax is less than what you would pay if you did not enter into a salary sacrifice agreement and instead were subject to PAYG withholding tax on your earnings. However, the concessional tax treatment is limited to a set amount of contributions made each income year. On 1 July 2016, Sally and Zoe started work at Green Thumb Gardening, earning $45,000 a year. Zoe entered into a salary sacrifice arrangement with her employer to sacrifice $10,000 of her earnings into her super fund. Sally did not salary sacrifice any of her salary. The following is brief overview of the current key rates and thresholds that apply in relation to superannuation. The super co-contribution is a Federal Government initiative to assist eligible individuals to save for their retirement. If you are eligible and make personal non-concessional contributions, the government will match your contribution with a super co-contribution up to certain limits. This overveiw looks at the new legislation that has been passed by the government that allows concessional contributions made from 1 july 2012 to attract the governments new low income supperannuation contribution (LISC). Coinciding with the commencement of LISC from july 1 2012, the Government co-contribution (relevant to non-concessional contributions) is expected to decrease. The lower income threshold is indexed in line with AWOTE each income year. However, government proposals have led to the lower limit threshold being frozen for the 2010-11 and 2011-12 years. How much you’ll receive depends on you income. For every dollar you contribute from your after-tax income, the Government will put in 50 cents, up to a maximum of $500. Use our contributions advisor calculator or the table below. The superannuation guarantee requires employers to contribute a minimum of 9.5% of an eligible employee’s earnings (ordinary time earnings) to a complying super fund or retirement savings account (RSA). Your contributions need to be made at least every quarter. The maximum super contribution base is used to determine the maximum limit on any individual employee’s earnings base for each quarter of any financial year. Employers do not have to make SG contributions for earnings above this limit. * Indexed in line with AWOTE each income year. personal contributions claimed as a tax deduction by a self-employed person (that is, pre-tax income used). The temporary higher contributions include personal contributions for which you do not claim an income tax deduction. personal contributions for which you do not claim an income tax deduction (that is, after-tax income used). * age on July 01. Under the CGT cap, non-concessional super contributions from the sale of a small business will be excluded from the NCCC up to a lifetime limit amount. Small business sale proceeds above this lifetime limit will be included in the NCCC. The untaxed plan cap amount limits the concessional tax treatment of benefits that have not been subject to contributions tax in a super fund (such as some government funds). The untaxed plan cap amount applies to each super plan from which a person receives super lump sum member benefits. * The untaxed plan cap amount is indexed in line with AWOTE, in increments of $5,000 (rounded). * The application of the low rate threshold for super lump sum payments is capped at $195,000 (2016/17). ^ The untaxed plan cap is $1,415,000 (2016/17). If you have commenced an allocated pension or annuity on or after 1 July 2007, a minimum amount is required to be paid to you each year. There is no maximum amount (excluding “Transition to Retirement” pensions), other than the prevailing balance of your account. The tax-free component of any income drawn is not assessable and not exempt income in all cases. Medicare levy (2%) will apply if amounts are assessable. 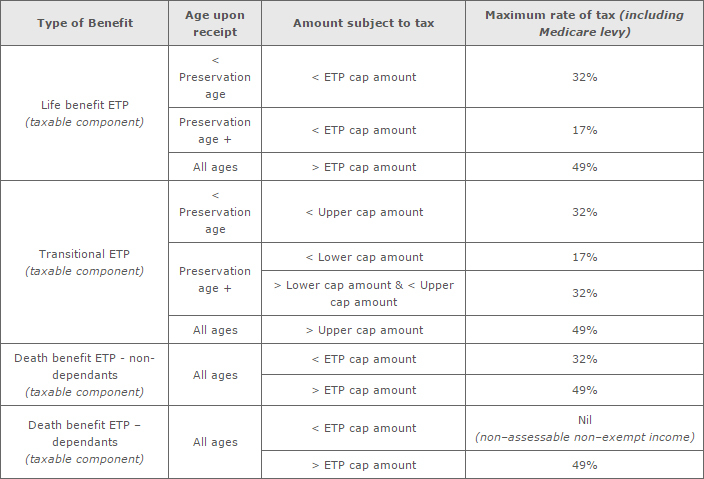 The amount up to the ETP cap amount will be taxed at a concessional rate. * The ETP cap amount is indexed in line with AWOTE, in increments of $5,000 (rounded). a workplace agreement under the Workplace Relations Act 1996. Employment termination payments made after 1 July 2007 (other than those made under the transitional arrangements) won’t be able to be contributed to or rolled over into super. the top marginal rate for amounts in excess of the upper cap amount. Superannuation been specifically designed and endorsed by the Federal Government as a preferred way to save for your retirement, and has, therefore, unique tax benefits that make it particularly attractive. Superannuation can be a tax effective way of building wealth for your retirement. The tax rates imposed will differ depending on what stage of life you are at and in what manner the super funds invested are held. “income stream” – also commonly referred to as “pension phase”, this is when your super funds are converted into a tax-effective structure that provides you with an income source. Generally occurs once you have retired. Contributions Tax is a maximum of 15%. Investment income is taxed at a maximum of 15%. Capital Gains are taxed at a maximum of 15%. However, if the asset has been owned by the superannuation fund for more than 12 months the maximum rate of capital gains tax is 10%. Contributions tax does not apply as no further contributions are able to be made once established. All income and capital returns achieved by the funds invested are tax free. Pension payments received from the income stream are also tax free for individuals over age 60. For individuals aged between 55 and 60, pension payments (less any tax free proportion) will be taxable at the individual’s Marginal Tax Rate. However, a 15% tax offset is available that can be used towards minimising potential income tax liability. These superannuation tax rates are in contrast to personal marginal tax rates, which could be considerably higher. Generally, you must reach your preservation age before you can access your super. Use the following table to work out your preservation age. Preservation age is not the same as pension age. Pension age is when you become eligible for government pension benefits, depending on your income and assets. There are rules for how you can access each category. There is no requirement for the fund to pay these benefits once a member reaches a certain age. Benefits need to be cashed as soon as practicable after a member dies. Generally, you cannot access preserved benefits from a super fund or retirement savings account until you have satisfied a condition of release. As long as your employer or your employer’s associates have made superannuation contributions on your behalf, your fund can pay you restricted non-preserved benefits if that employment is terminated. They can also pay you under the same conditions as preserved benefits. You must meet a condition of release before your super fund can pay you a benefit. Your fund can only pay benefits if the fund’s rules allow it. release of benefits under an ATO release authority. There may be restrictions as to how the benefit may be paid. have a terminal medical condition. You must send your application to the Australian Prudential Regulation Authority (APRA) if you want to access your super benefits early due to compassionate grounds. If you have a terminal medical condition, you can apply to your super fund to access your super benefits tax-free, regardless of your age. The final decision to release your super benefits is subject to the rules of the fund. This means, if you are 55 years old or over, you can reduce your working hours without leaving your job or reducing your total income. You can top-up your income with a regular income stream from your super savings.